The first official day of summer around here was actually pretty rainy. And then so was the next day. And the next. Meaning we spent quite a bit of time inside, watching the raindrops roll down the windows. And with beautiful weeks ahead of us (and lots of rain hopefully behind us), that only means our time spent outdoors enjoying the sunshine will increase tremendously. My girls love to play outside, whether going for a walk, hanging out at the park or just coloring with chalk on the driveway. One of the first things we do to prepare for heading out to enjoy the fresh air and warm weather? Apply sunscreen, of course. For me, I want a lotion that absorbs easily, feels light on my skin and can be worn all day without being greasy. So, for serious sun protection that is good for me and the environment, I turn to SmartShield. I was introduced to SmartShield in March through a review of their Self Tanner with SPF 15. As well as enjoying the ability to have a nice, natural glow while protecting my skin, I was really impressed to learn about SmartShield as a whole and their entire line of safe, eco-friendly, hypoallergenic, dermatologist-approved sunscreens. Unlike oil-based sunscreens that can clog pores, sting your eyes and leave you feeling slimy, the formula for SmartShield SPF 30 Sunscreen Lotion is fast-absorbing and contains aloe vera and vitamin A, C and E to keep your skin protected, soft and smooth for hours. Combine that with the fact that this sunscreen features UVA and UVB protection and is waterproof and rubs on clean and evenly and I have no problem using it to keep myself safe from the sun's rays. With a wide variety of products to make your times outdoors more enjoyable, SmartShield has a suncare product to fit any lifestyle. For people who prefer spray sunscreens instead of lotions, the sunscreen I tried also comes as a SPF 30 Sunscreen Spray for a quick, fast-drying application. Or, for all-around protection, I love the idea of the SPF 30 Spray with Insect Repellent to combine everything you need to stay protected from both the sun and the bugs. The convenience of having both products combined into one handy spray just makes sense! On top of being innovative, SmartShield's products are also eco-friendly, something that is not necessarily true of most sunscreens that I've seen before. Approved for use in natural marine habitats, their sunscreen is bio-degradable and won't contaminate the water. Simply apply and continue fishing, swimming, snorkeling or diving without transferring any oily residue - how great! One lucky person will win a 4.5 oz bottle of SmartShield SPF 30 Sunscreen Lotion! To enter to win: Visit SmartShield and tell me another of their products (not mentioned above) that you would like to try. 3 Extra Entries if you blog about this giveaway linking back to Thanks, Mail Carrier and SmartShield. Please leave an address where it can be found. Giveaway will end on July 22nd at 11:59pm CST. Do me the favor of leaving an email address or making absolutely sure it is visible in your profile, I have to have a way to contact the winner. The winner will be chosen by random.org and announced here as well as emailed and will have 48 hours to contact me or respond to notification or a new winner will be chosen. This giveaway is open to U.S. residents only. A big thank you to SmartShield for providing a bottle of SPF 30 Sunscreen Lotion for me to review as well as for one lucky giveaway winner. The opinions shared are my own and honest and if you really need to see more, click here to see how I roll. Hi, what a great blog! I am here from "FMBT" and am I now following! Would like to try trial sized bottles of their sunscreen so my husband can take them to Iraq with him. I'd love to try the lip balm with spf. Wow - awesome blog! I found you fromt he blog hop & I'm now following you. I am a new follower from FMBT. 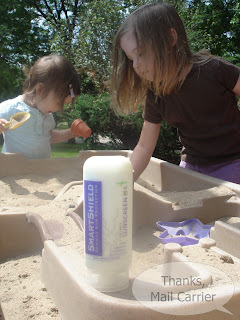 Great giveaway...I would love to try their SPF 30 Sunscreen Towelette with Insect Repellent(box of 50). I would like to try the Natural Insect Spray! I would like to try their self tanner! I'd like to try the Insect Repellent Stick with Cedar & Lemongrass. I would love to have the towelletes to keep in the diaper bag. I am a google friend connect follower 1. I am a google friend connect follower 2. I liked Smartshield on Facebook. I left a message on the SmartShield wall. The SPF 30 lip balm is something I'd like to try. The after sun products also look intriguing. i'd try the self tanner lotion. I'd love to try their self tanner or sunscreen gel. Thanks for the chance! Entered My Baby clothes giveaway! I'd like to try the Natural Insect Spray. Entered Growing Tree Toys giveaway! I'd like to try the Lip Balm with Sun Screen.